Capital Improvement Windows are designed to provide energy efficiency and maintenance free beauty. Vinyl frames and sashes will never chip, peel, crack or warp. Made with premium raw materials, the vinyl color is formulated throughout so the beautiful luster lasts. Multi-chambered sash and mainframe create insulating air spaces for thermal efficiency. Interlock at sash meeting rail adds to your sense of security, comfort and well-being. PPG Intercept® (Warm-Edge Spacer System) maximizes thermal efficiency and the life of the insulated glass unit. Bulb seal at the sill provides extra protection from the elements – sealing tightly against dust, dirt and air infiltration. Dual ventilator locks provide a limited and secure opening of the window for ventilation. Protective double barrier-fin weatherstripping at sash sides helps block dirt, noise, and air infiltration. 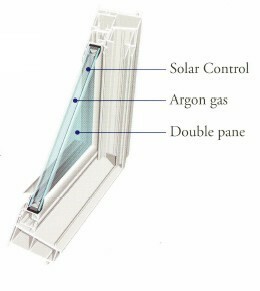 Double-glazed unit built with one pane of Solar Control on surface two, one chamber with insulating argon gas, along with the Intercept Spacer System. Learn more about our Windows.